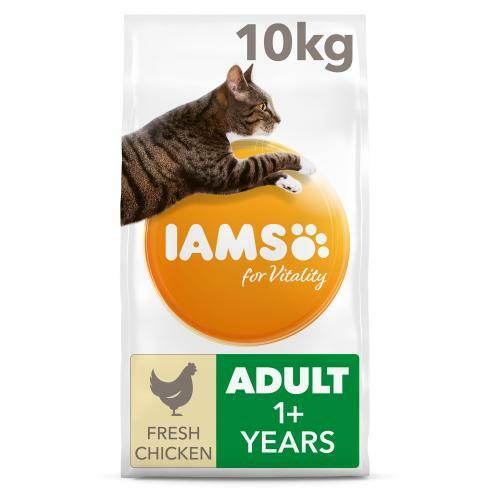 IAMS for Vitality Chicken Adult Dry Cat Food is 100% complete and balanced cat food for your cat to enjoy and thrive on. IAMS for Vitality for adult cats has an improved recipe contains 87% animal protein (out of total protein) and everything your furry friend needs as well as a delicious taste. Each cat has a unique personality. And only you knows your pet individual character, but Iams knows the nutrition they need for the 7 signs of healthy vitality. STRONG IMMUNE SYSTEM: Antioxidant blend with vitamin E to help support the immune system. HEALTHY DIGESTION: Tailored fibre blend including prebiotics and beet pulp for healthy digestion. Ingredients: Dried chicken & turkey 40% (chicken 24%, a natural source of taurine), maize, sorghum, pork fat, fresh chicken (4.1%), dried beet pulp (1.7%), chicken gravy, fructooligosaccharides (0.69%), potassium chloride, fish oil, brewer's dried yeast.